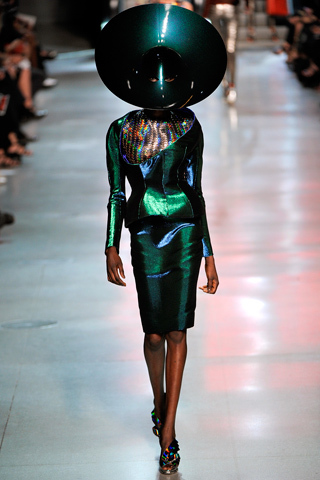 The hats (made by Philip Treacy), the shining blues, greens and reds, and the sharp cuts of the Paco Rabanne by Manish Arora Spring/Summer 2012 Show are inspired by Anish Kapoor’s « I Have Places Like These, You Have Places Like These » work. Some Anish Kapoor-inspired collections and items or Anish Kapoor’s collaborations : BVLGARI Spring/Summer 2010 (« B Zero 1 » ring, in collaboration with Anish Kapoor), Dior by Camille Miceli Spring/Summer 2010 (some jewels were reminiscent of Anish Kapoor’s cement work, « Greyman Cries, Shaman Dies, Billowing Smoke, Beauty Evoked »), Dirk Schönberger for Joop ! Autumn/Winter 2008-2009 (hats influenced by Anish Kapoor’s sculptures), Frédéric Malle (the sprays that Pierre Hardy designed for the Frédéric Malle perfumes, in 2011, had tops that were reminiscent of Anish Kapoor’s works), Louisa Guinness Gallery (since 2003, the gallery has commissioned Anish Kapoor to create jewelry, unveiled at http://www.louisagallery.com), Sisley (the bottles of the « Black » and « White » editions of the « Eau du Soir » perfume, launched for Fall 2010, were inspired by Anish Kapoor), Stéphane Rolland Couture Autumn/Winter 2010-2011 (inspired by Anish Kapoor’s « Cloud Gate » sculpture). Thank you @brandiedevanny for stopping by !